An Easy Veggie Packed Clean Eating Breakfast that you can literally throw together in a couple of minutes and let the oven do the rest of the work. 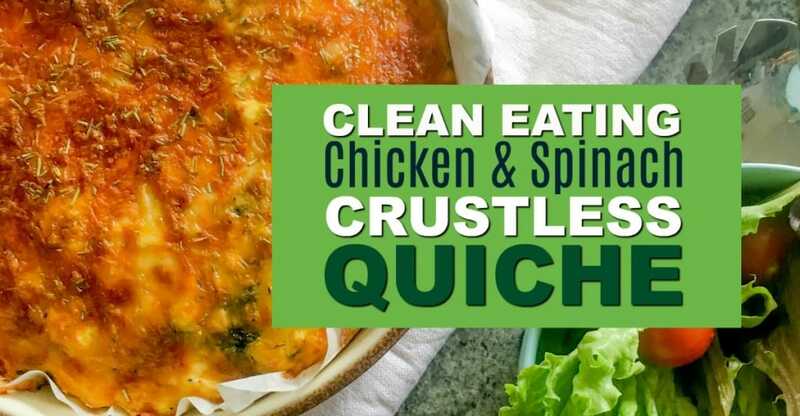 This Clean Eating Crustless Quiche is super versatile so feel free to add your own choice of meat and veggies to mix it up a bit. This is a brilliant way to feed a crowd. It’s super easy to put together with the oven doing most of the work. If you are serving it as a lunch or light dinner, then add a little side salad to bulk it up if needed. 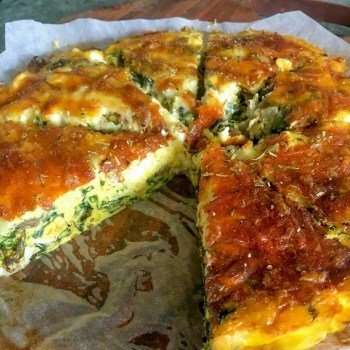 A versatile, veggie packed clean eating quiche that is low on carbs and packed full of protein. An easy way to get more vegetables into your childs day. Sautee mushrooms in a pan until mushrooms are soft and moisture evaporated. Spread Spinach, chicken, mushrooms & feta on the base of the dish. In a separate bowl, whisk eggs and eggs. Pour over the top of the chicken and vegetables. Season with Salt and Pepper & top with the grated cheese. Bake for 40- 45 minutes until top is golden. Cut into 6 slices and serve. An easy Clean Eating Breakfast or lunch that is a great way to feed a crowd with minimum effort.